I’ve been putting our locally-grown, freshly ground Richardson Farms whole wheat flour through its paces lately. Here’s a quick cake composed of a slightly dense and chewy spongecake layer blanketed with an unreasonable heap of sweet, cinnamon-y crumbles. More streusel than substrate, crumb bums will appreciate this easy, tweedy whole grain goodie. For streusel fans only! 1 stick organic butter, melted. I love Organic Valley. Click for a coupon. 4 3/8 ounces organic light brown sugar. Central Market’s brand usually costs less. 5¼ ounces Richardson Farms whole wheat flour. Sifting out the bran is optional. ¼ teaspoon salt. I use Real Salt. ½ teaspoon vanilla extract. I used my homemade Christmas gift from SouthAustinFoodie Adventures. Check out her foodie fun this week on the Anthony Bourdain trail. 200 grams turbinado sugar. I buy this in bulk at Central Market. Bring your own container and a staff member can tare the weight for you. We go through a lot of this—we always have homemade lemonade on hand—so I buy about three pounds at a time. 121 grams Richardson Farms whole wheat flour, most of the bran sifted out. 1 teaspoon baking powder. I use Rumford, aluminun-free and non-GMO. Preheat your oven to 350°. You can melt the butter in the oven while it’s heating up. 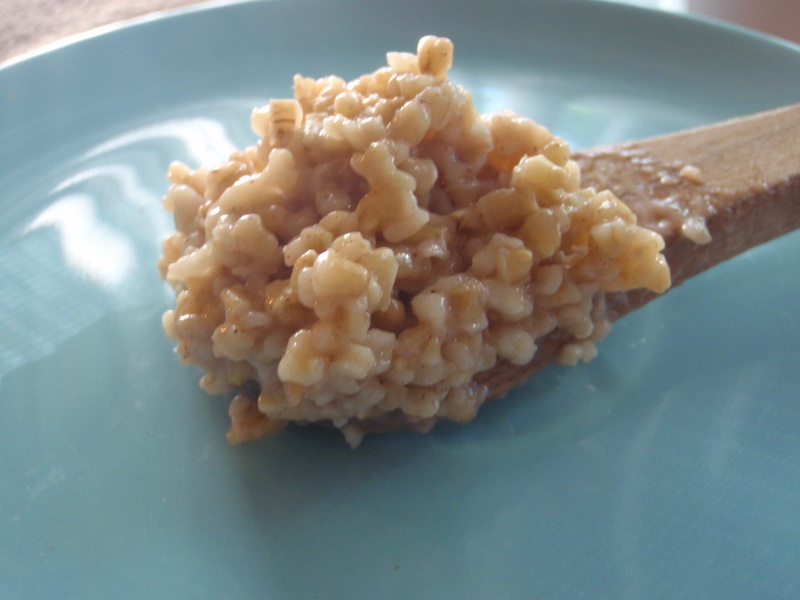 Combine the remaining streusel ingredients and stir them into the melted butter. Line a 9″ X 2″ round pan with a piece of waxed paper or parchment (I use If You Care brand) and butter the bottom, but not the sides. Combine the eggs, turdinado sugar and salt in a mixer bowl and begin whipping (with the whip attachment if using your stand mixer, which I recommend) at low speed. Gradually increase the speed to medium-high. You’re starting the eggs and sugar out slowly to give the sugar a chance to dissolve. It won’t liquefy completely, however. Meanwhile, whisk together the flour and baking powder. Get your water heating up. I use the microwave. It’s fast and energy efficient. When the eggs look very light and fluffy and fall back into the bowl in ribbons that take a moment to dissolve when the beater is lifted, gently add the flour and quickly whisk it in. Pour in the boiling water and quickly and gently whisk it in to achieve a smooth batter. Pour the batter into the prepared pan right away. Working quickly, squeeze handfuls of streusel into clumps and distribute them in chunks over the batter, moving from the outside to the center. You don’t want the middle of the cake to be too heavily laden with topping so be more generous around the perimeter. Bake for about 35 minutes, until the cake portion tests done in the center. The lava-like batter will erupt magmaticaly, creating a sweetly fissured surface. Never mind the cratered face, she’s tastes like a beauty! A while back we used up the rest of the spinach queso from game night. Refrigerated previously boiled local potatoes–ready to be called into action, braved friendly fire to yield quick homefries. I smash ’em with the heel of my hand for rough chunks, season them with plenty of salt and pepper and give ’em a hot fat bath for crispy crusts. generous ¼ cup organic heavy cream, chilled. Organic Valley is great. Click for a coupon. 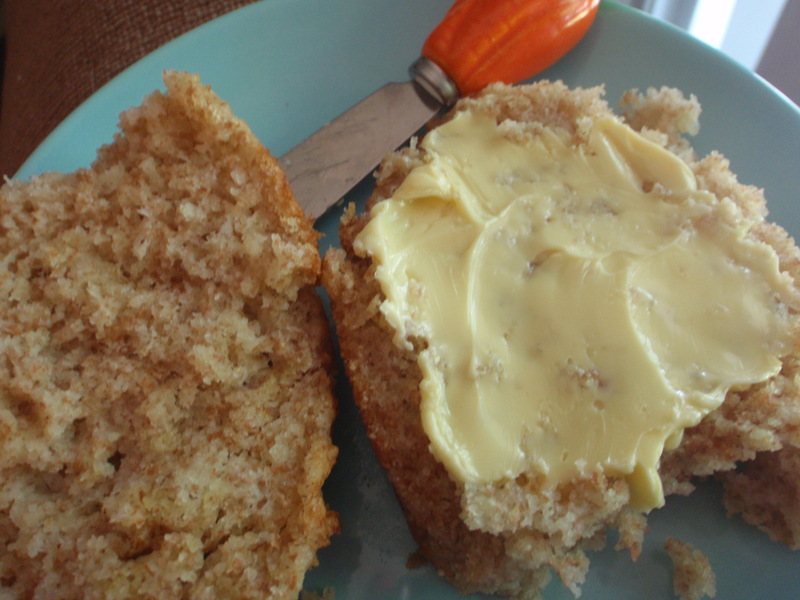 2 ½ Tablespoons organic butter. I love Organic Valley. Preheat the oven to 400º. Whoop up your eggs til foamy and at least tripled in volume. A stand mixer is best for this. Meanwhile, whip your cream to soft peaks. I use a cold balloon whisk. Cold bowl, cold cream and cold whisk equals minimal whoopin’ time so don’t worry about throwing your arm out. And meanwhile meanwhile, heat up the butter and black pepper in a 12″ nonstick or well-seasoned skillet (with an ovenproof handle) on medium-low heat, swirling the pan to spread the butter around. You want the butter to bubble and brown a bit for a toasty, tasty crust on your omelet. When your eggs have achieved their loftiest volume, quickly fold in the cream using the whisk. Pour the mixture into your hot pan and cook for three minutes, until the edges of the omelet have begun to set. Place the pan in the hot oven and bake for six or seven minutes, until set in the middle. 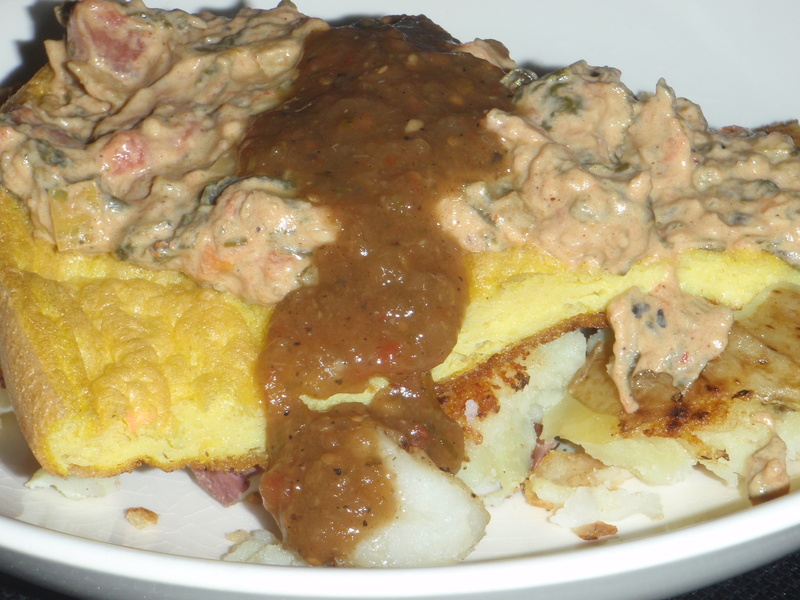 Slide the omelet onto a cooling rack and slice and serve right away. Actually cold leftovers are still delicious. We enjoyed our most recent fluffata on a bed of those homefried local potatoes, topped with the spinach queso (Cora Lamar’s triple-washed savoy greens from Poteet) and salsa. The kindergartner’s show-n-tell/snack day at school done snuck up on us. On game day to boot! Local broccoli stems saved me again, investing mini-muffins with the good nutrition necessary for all that learnin’ the kids are up to. Although I had none left over to enrich the (orange!) carrot cake (see Broccoli Bonus) I made for Longhorn viewing, a cake full of local carrots tastes just as sweet. These muffins might not fool the herbiphobic adult or teenager, but kids won’t notice the jolly green goodness in these tasty treats. The students wolfed ’em down! 227 grams (2 cups packed) finely shredded well-peeled local broccoli stems. You can substitute half or more shredded local carrots for especially finicky palates. zest of one local an/or organic lemon. Ask your neighbors! ¼ teaspoon salt. I like Real Salt. 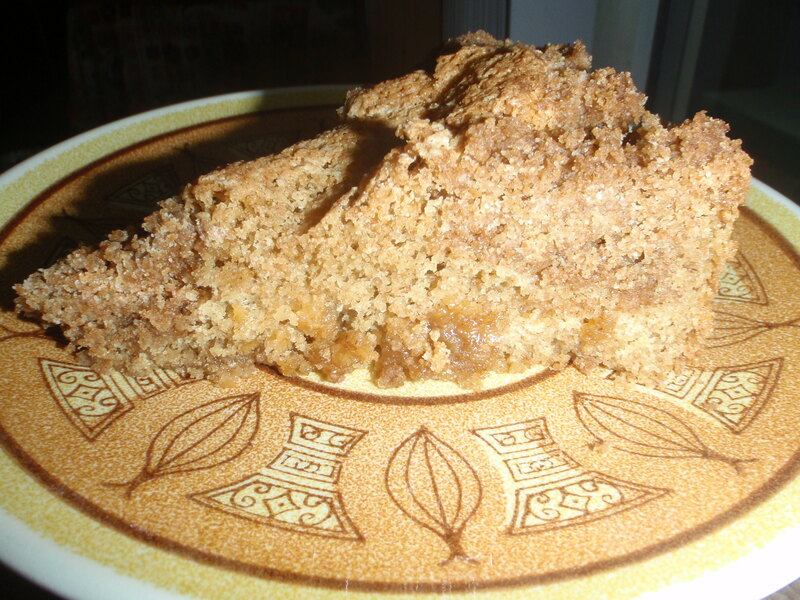 163 grams (¾ cup, firmly packed) organic light brown sugar. Central Market’s organic brand sells for $2.99 for a 1½ pound bag. 2/3 cup chopped toasted Texas pecans, optional. I omit these for the classroom. 107 grams (½ cup) organic coconut oil or other oil suitable for baking sweets. Whole Foods 365 brand virgin coconut oil is a good value. Coconut oil will solidify when it’s chilly, so warm it up if necessary. 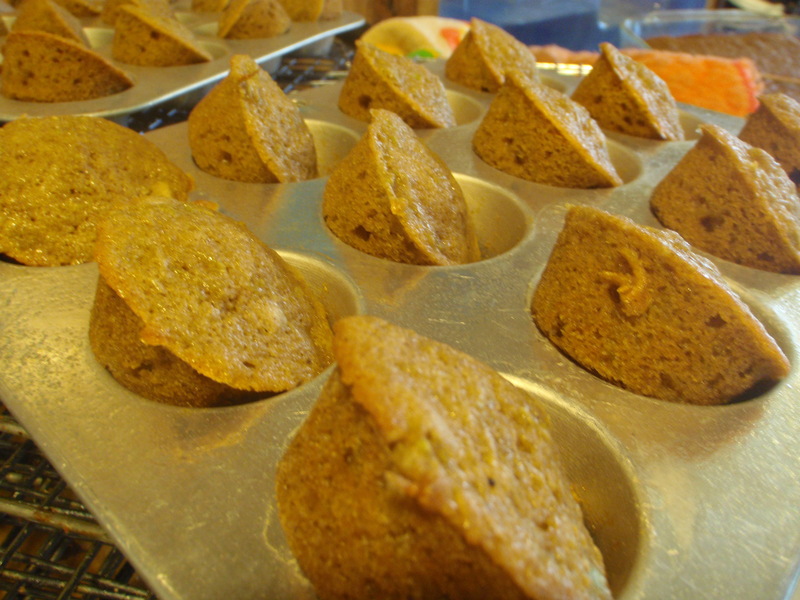 Get your oven going to 350º and grease up 3 one dozen cavity mini muffin tins, or whatever configuration you have. I find Spectrum baking spray to be the easiest greasing option, but I’ll leave that choice up to you. Fill the prepared tins (I like to use a spring-loaded scoop) and bake for 12 to 15 minutes, until the muffins test done. Let cool in the pans on a rack for a couple minutes before gently releasing the muffins from their wells (I use a bamboo skewer, the same one I test them with) and letting the muffins cool obliquely in their cups. Frost with organic cream cheese frosting if desired. Whip together ½ stick organic butter, ½ block organic cream cheese (CM organics brand is the best buy at only $1.99 per ½ pound), 100 grams (1 cup) organic powdered sugar (CM organics again), 1 teaspoon local honey (I like Good Flow—we have many honeys to choose from around here) and ½ teaspoon vanilla extract. We eat stuffing all year round. It’s a delicious and thrifty way to use up stale bread, which we accumulate in the freezer. When the “old bread for stuffing” bag is full, I bake up a batch. No tellin’ what’ll end up in the pan: assorted vegetables, nuts, cooked grains and meats (bacon!). Mix ‘n’ match bread types for hybrid vigor. What are you gonna do with that leftover Thanksgiving stuffing? Today’s Sunday, so make waffles! 1 stick (4 ounces) organic butter, melted and cooled a bit. You know I love Organic Valley. Use a Whole Foods Whole Deal coupon for $1 OFF or click for a coupon to use at another store. 2 cups yogurt (homemade is great), buttermilk or a 50/50 combo of yogurt and milk (stir it up and let it sit while the butter melts). I buy local goat milk from either Swede Farm Dairy or Wateroak Farm. about ½ teaspoon salt, to taste. I use Real Salt. I get this in bulk at Whole Foods. You can bring in your own jar. sweetener to taste. 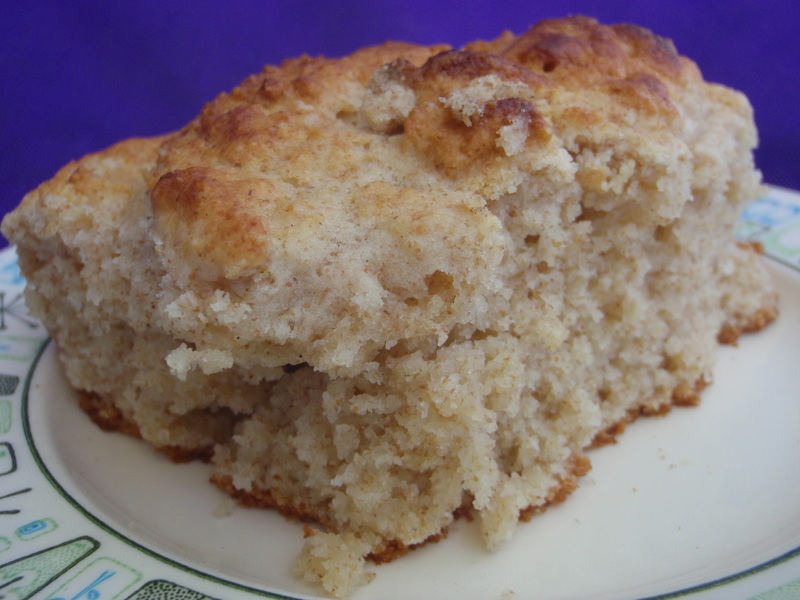 For a cornbread dressing version (baked with unsweetened cornbread) I use 2 Tablespoons local honey (Good Flow). For a (regular) bread stuffing version, I’ll use maybe 2 teaspoons turbinado sugar. 41 grams (1/3 cup) organic all-purpose flour. WF 365 brand in the 5# bag is usually the best buy. 41 grams (about 1/3 cup) whole wheat flour. I use either organic or Richardson Farms locally-grown. 40 grams (about 1/3 cup plus 1½ Tablespoons) organic whole wheat pastry flour. 2 teaspoon baking powder, sieved. I like Rumford, aluminum-free and non-GMO. 1 teaspoon baking soda, sieved. 2 cup leftover stuffing, chopped. Whisk together the yogurt, eggs, salt and sweetener, then whisk in the melted butter. In a separate bowl combine the dry ingredients, through the black pepper, and whisk until mixed. Whisk the stuffing into the yogurt mixture, then whisk in the flour. Let the batter rest, covered, in the refrigerator for about an hour. Bake in a greased, preheated waffle iron. Timing and batter amounts will vary depending on the size and design of your iron. 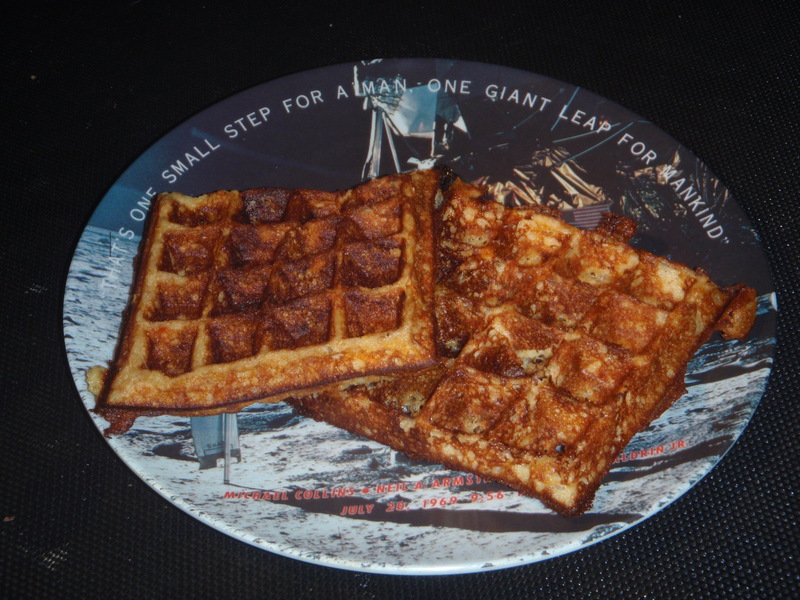 I prefer a deep-pocketed Belgian-style waffle iron for most of my waffle recipes and I recommend that style for this one as well. Organic maple syrup tastes great on these savory waffles. Or, pour gravy on em! We already ran out. Leftovers only stretch so long.